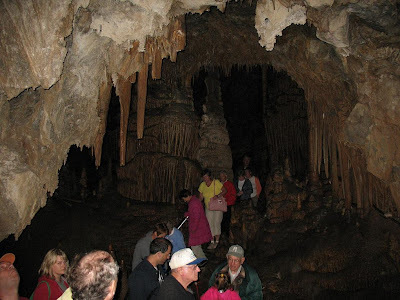 One of our favorite things to do in Montana is to visit Lewis & Clark Caverns! I saw them many times growing up and now my son has even seen them twice. 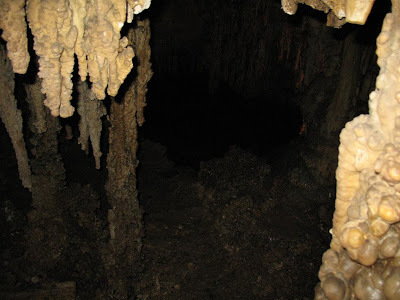 It's very hard to get good pics as it's so dark in the caverns, so much space, and the cave absorbs the flash. But, there are a few pics to at least give you an idea. 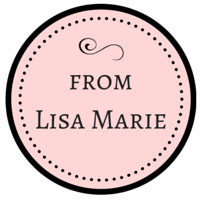 So join me for a little tour! 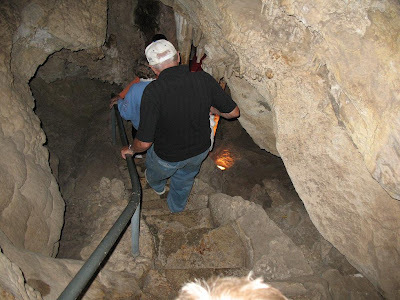 Trail to the cavern entrance. 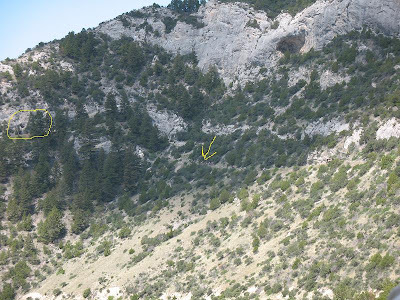 Arrow points to trail with people hiking on it and circle is around the approximate cave entrance. 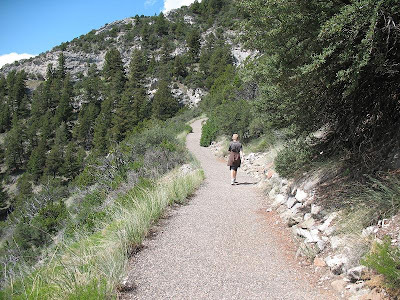 It's about a 3/4 mile hike, climbing 300 feet in elevation. There's my son starting off the hike. Of course, he ran up part of the way! I huffed & puffed in the high altitude and slowly made my way up. My son at the entrance. 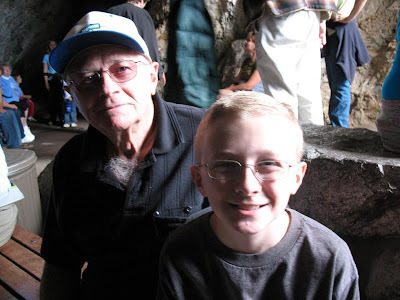 My son and his Grandpa! 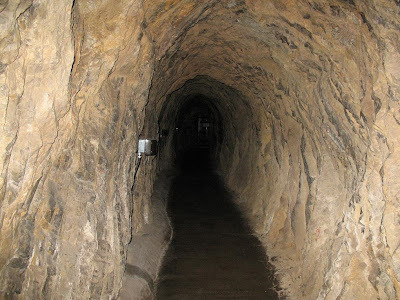 Let's head through the tunnel! 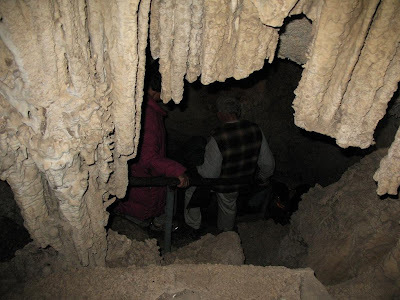 Looking through broken stalactites as we head down. 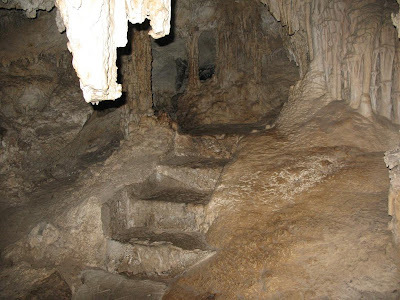 Stairs chiseled into the cave. 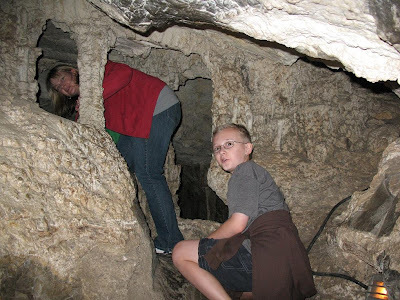 Me & my son climbing through (with lame facial expressions!) - you have to bend over in half in so many places! Down some more. Upper right of the pic has some formations in the dark. Watch your head! My Dad bumped his a few times - ouch! Me and my bright green purse managed to navigate just fine! Flash wouldn't show it, but there's a pool waaaaaayyyyyy down at the bottom of the dark hole. Spectacular, isn't it?! OK, I couldn't resist - this is just black. 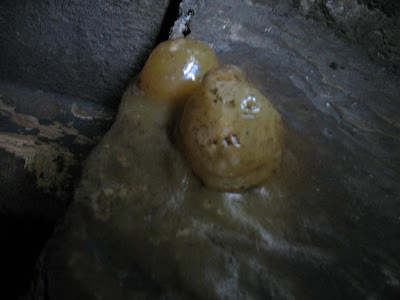 But when you get into the heart of the cave, they show you what it was like for the workers if their candles went out. They turn out all lights and you CANNOT see your hand in front of your face even if it touches your nose.  I think they call it natural total darkness? The color comes from minerals in the water. 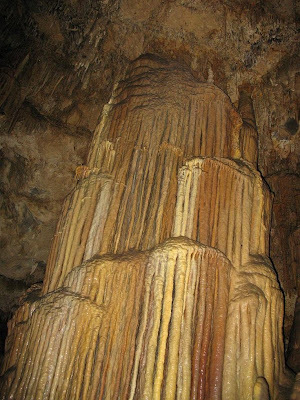 This formation is called the Brown Waterfall. Now we are climbing up. Looks like some cave popcorn. Can't remember how these form, but don't they look interesting? 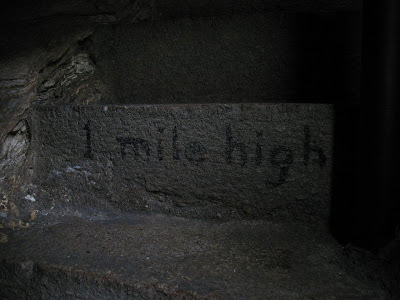 Though we are inside a cave, we are at a mile high in elevation. Up stairs into the final room. 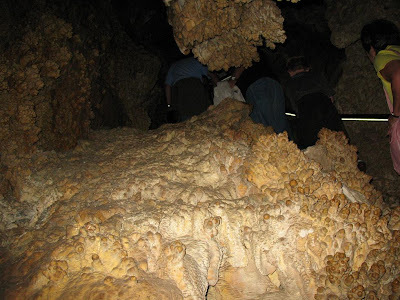 Try to see some of those formations in the dark - fantastic! Coming out of the fabulous final room. We were so surprised to walk out into hail!! Good thing it wasn't any bigger or we could have been hurt! My dad's head did get hit and was stinging, but the rest of us just felt a few little hits. 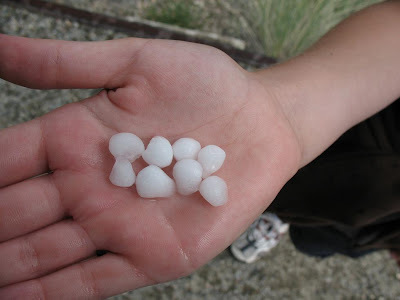 My son was so excited and was collecting the hail in his hand! What is this doing here?? Well, after all that hiking and climbing, we had to go somewhere good for lunch! We headed to Wheat Montana - yum! 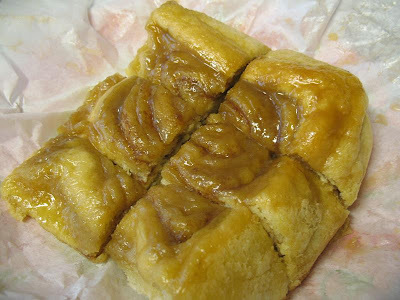 We saved this caramel roll for breakfast the next day. That baby is easily 6 inches square or more, so we cut it into 6 pieces and it fed 3 of us quite easily! Hope you enjoyed your tour today! Stop back here tomorrow for Chocolate Friday! 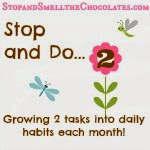 Get your chocolate posts ready to link up! Oh man! We would so love to do that. But I feel as though I were there with you, with all the great pictures! Big I so wouldn't have shared that caramel roll with anyone size hugs to you! 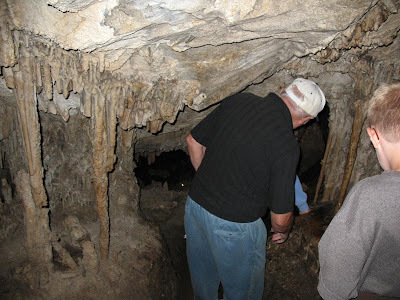 We've been to a cave here a few times. Well, a couple of them. They have a Lost Sea here in East TN. 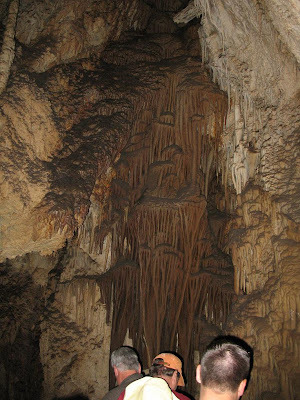 It's so neat to see all the formations. We got a really great guide the last time we went. She didn't say anything about "millions of years ago". She just said a long time ago. When we talked to her afterward, she said she was a Christian and wouldn't say "millions of years ago". I don't think anyone else noticed, but we appreciated it. I'll be back tomorrow (Lord willing). (My daughter just told me "That's a huge comment"). That is so amazing! We studied Lewis and Clark this year so that would have been neat to see! Thanks for taking us on the tour with you! I'm surprised they don't hand out hardhats at the beginning of the tour. LOL When I first saw the caramel roll, I thought it was another rock formation! Wow I would have been so scared to have done what you guys did! It looks so fun tho! Wow that looked like a fun hike. 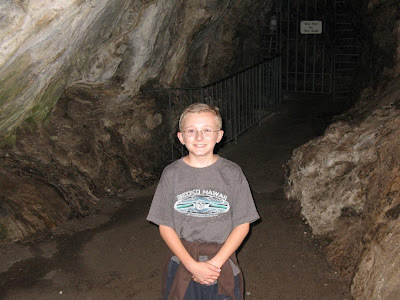 I love going to caverns like that and can't wait to take my son when he gets older. Oh and that caramel roll - it looks tasty! That must have been so neat to see in person! Those are fantastic photos. 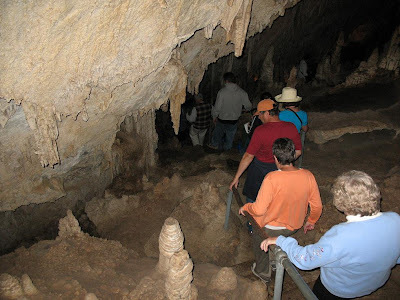 We love to go to caverns too! 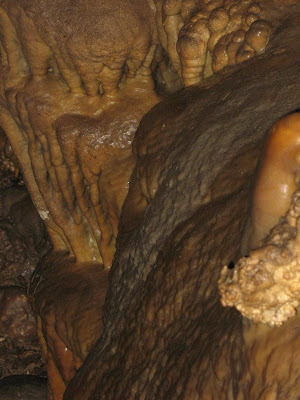 One of the neatest ones we ever saw was Ruby Falls (in Georgia I think) - it's beautiful! 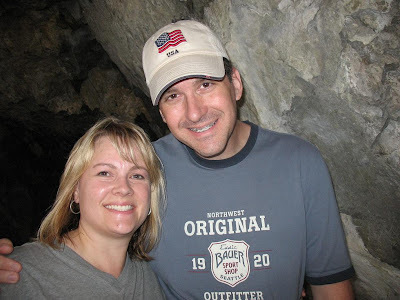 My hubby loves caverns! Me, not my thing. Looks like yall had so much fun, I'll have to share this one with him. 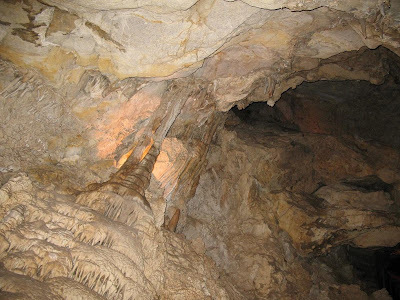 Caverns are so neat, we have some nearby and they are neat.. 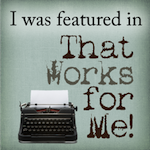 I think this is my first time to your blog, feel free to stop by and say hello at my blog as well and I am going to add your blog to my list of blogs to follow...feel free to follow my blog as well. Wow that is so awesome! 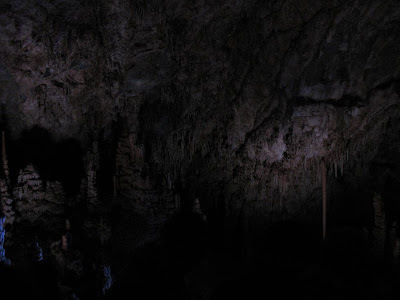 I love caverns. We have a few here in Texas. I am looking foward to some day taking my Baby DIVA to them...and possibly to your there in Montana!! Thanks for sharing your wonderful pics!! Beautiful pics! 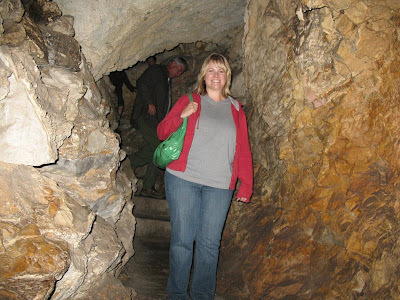 I haven't ever been into cave exploring but maybe I'll try. Quite spectacular! The pic of you and hubby was really cute, too! You are an awesome tourguide! Thanks for taking us with you - this was fun. I'd love to go through their with you! 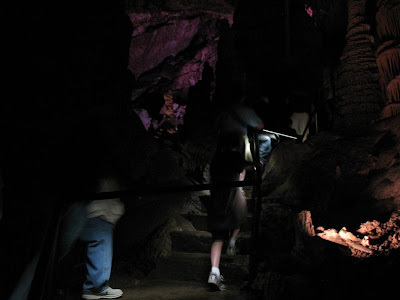 I was a Caverns tour guide for 3 years. 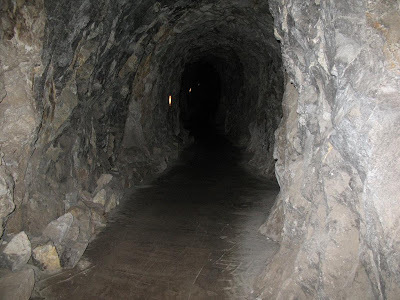 I took people down 1 mile under ground. I brought them all back out - don't worry.